Practically everyone has cinnamon in their spice drawer but some may not know its many health benefits and uses. 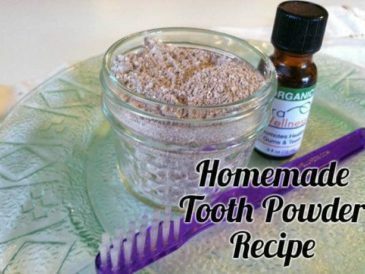 It is an ingredient in my favorite oral health products, and with good reason. This pleasant-tasting herb has a long history both in natural medicine and as a culinary favorite. From the Old Testament to the ancient Egyptians, many ancient cultures used cinnamon for anointing, preservation, and consumption. Cinnamon was so highly prized in the Middle Ages it was considered a luxury commodity and a status symbol. At one time, it was even more valuable than gold! Today, this spice still enjoys incredible popularity and resides in just about every spice cabinet. 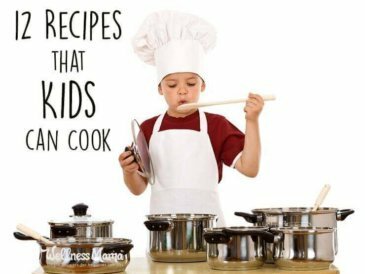 Just a mention of it probably brings to mind warm, comforting images like freshly baked muffins, apple pie, oatmeal, or mulled apple cider. The awesome part is, it has benefits beyond being sweet and spicy! Looking at the long list of proven benefits it’s no wonder this delicious spice has such a long history of use. Cinnamon fights against digestive trouble, kidney infection, colds, flu, hypertension, and even shows promise in fighting some types of cancer. 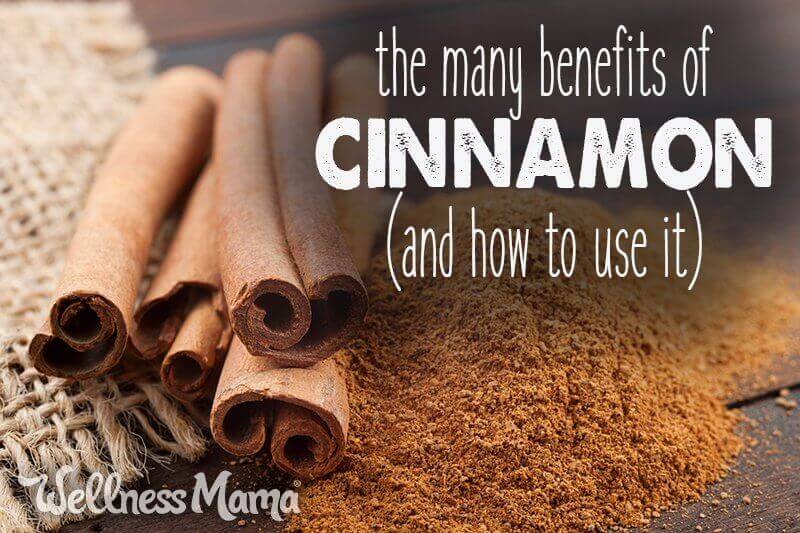 Perhaps the most well documented benefit is cinnamon’s ability to regulate blood sugar. 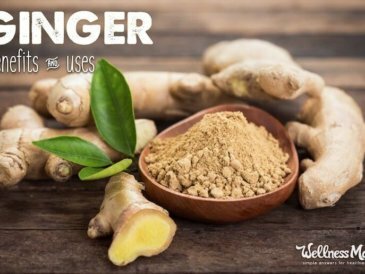 More study is needed as to what role the herb can play in pre-diabetic or diabetic treatment, but research shows hypoglycemic benefits from ingesting about 2 teaspoons a day. Studies show that the bark of the cassia variety strongly counteracts the enzyme responsible for inflammation. Add a pinch (or two or three) to drinks, recipes, or smoothies to get more anti-inflammatory benefits. Cinnamon bark oil is an especially effective antibacterial agent and has long been to disinfect and preserve. It has even been shown effective against E. coli. Certain species of cinnamon are effective against fungal infections, and it has even been used to treat oral candidiasis (a common symptom in HIV patients). Cinnamomum cassia bark has been shown effective against viral respiratory illness, flu, and colds. Can we fit any more “anti” in here? Yes! Cinnamon also exhibits antioxidant influence on free radical cells. The C. zeylanicum species shows the most potent antioxidant effects, but Ceylon or the more common Cassia varieties offer these benefits as well. 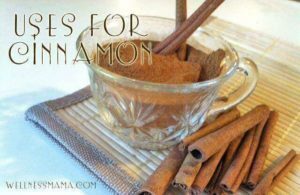 Since many compounds that help with insulin and blood sugar levels also lower blood pressure, cinnamon has benefits here too. In a study with rats, regular consumption lowered systolic blood pressure in hypertensive rats fed a high-sucrose diet (which makes my point about sugar!) almost down to the (normal) level of the non-sucrose consuming rats. Exciting new research shows that cinnamon may block a protein called tau in the brain. This is important because tau buildup is found in the brain of people with Alzheimer’s. The exact mechanism isn’t clear yet, but this may be a promising use. Many people do not realize that there are multiple types of this spice. The two main types are ceylon and cassia. Both are considered healthy, but it is important to know the difference when using cinnamon as a remedy. The smell and flavor in cinnamon comes largely from a compound called cinnamaldehyde. Cinnamaldehyde is responsible for many of the health benefits of cinnamon as well but the dose makes the remedy in this case. Too much cinnamaldehyde can be harmful. But not to worry … there are safe cinnamon options that don’t contain too much cinnamaldehyde. Ceylon is considered “real cinnamon.” It comes from the inner bark of the Cinnamomum verum tree and grows in Sri Lanka and parts of India. It has a milder flavor than Cassia due to its lower cinnamaldehyde content. This also makes Ceylon a safer cinnamon for use as a remedy. I personally prefer Ceylon in culinary uses as well since it has a slightly milder flavor. This is the one I use. This is the cinnamon you’ll find in most grocery stores. It comes from the Cinnamomum cassia tree and originates in China. Cassia is a cheaper variety but over 90% of its oils come from cinnamaldehyde. This makes it great for using in recipes since a little goes a long way. Many experts warn against using this variety as a remedy though due to the high cinnamaldehyde content. Cassia also contains high levels of coumarin. This substance can cause liver damage in high amounts. In fact, the government of Denmark recently started regulating cinnamon use in bakeries to make sure that people aren’t consuming too much coumarin. Ceylon does not contain high levels of coumarin. Is It Bad to Eat Too Much Cinnamon? Like anything, too much of a good thing can be harmful. This is true with water and it is certainly true with this spice as well. Experts agree that culinary use is almost always safe (as long as we aren’t adding 1/4 cup to a smoothie), but there are some important cautions with using it as a remedy. Studies have looked at diabetics using up to 6 grams of cassia cinnamon a day for blood sugar management. They found improvements in fasting blood glucose and other measurements (compared to placebo) and did not report any adverse side effects. Cassia is traditionally used in studies, probably because it is more widely available, but many experts recommend Ceylon for the benefits without the coumarin and high levels of cinnamaldehyde. That said, all the available research I found indicates that small amounts of 1-2 teaspoons a day of either type are likely safe for those without a medical condition. Of course, anyone under the care of a doctor or taking a medication should check to make sure there are no contraindications or interactions before taking large amounts of anything. How Much Cinnamon to Eat? I asked several doctors I trust this question. The consensus was the research shows that up to 6 grams per day (for adults) seems to be safe. They recommended using only a high quality Ceylon variety and also cycling on and off for best results. In fact, at a recent visit to a biological medicine clinic, the doctor there said that in almost all cases, supplements of any kind should be cycled. She recommended taking supplements only during the week and resting on the weekend so that the body would have a break and would not acclimate to the supplement. (Of course, this would not apply to medications). In the Morning – Add a pinch to a cup of hot tea for a boost of energy (and sweetness) to start the day. Or, add some to your coffee! I like to add to the coffee grounds before brewing. For Colds and Flu – Take up to a 1/2 teaspoon in a cup of tea with lemon juice and honey, or add it to elderberry syrup. 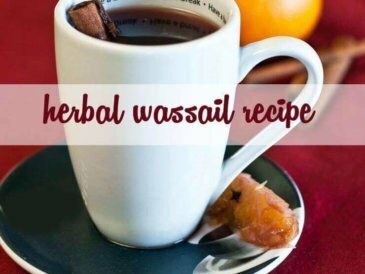 For Coughs – This herbal cough syrup is another immune-boosting way to use cinnamon. In a Tincture – Add cinnamon to a homemade tincture to increase absorption of the herbs and improve flavor. As a Digestive Remedy – I take a 1/2 teaspoon in water, tea, or capsule form after a meal out where I’ve consumed foods that I normally wouldn’t eat. In Oral Products – As I already mentioned, cinnamon’s oral health benefits are well documented. Try this recipe. In Savory/Spicy Meals – Curry and jerk seasoning blends often feature cinnamon, or try making your own. 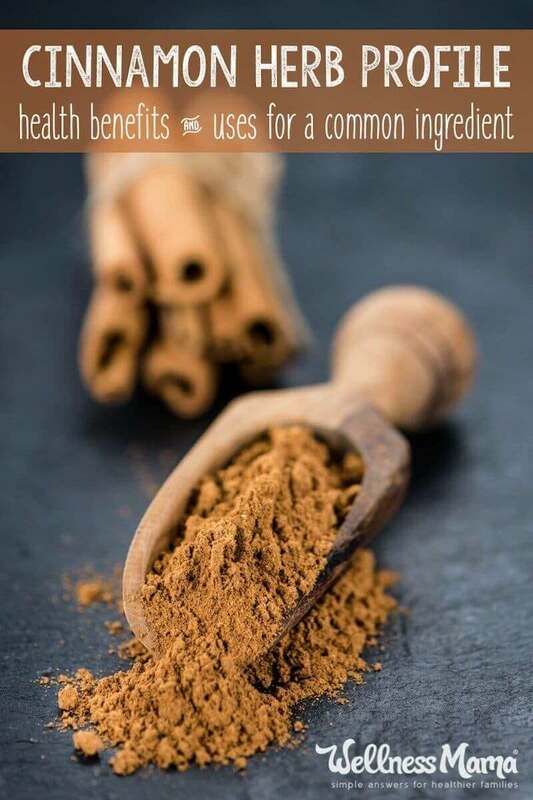 For Weight Loss – My podcast guest Nagina Abdullah recommends cinnamon to soothe late night sugar cravings and boost metabolism. For Vaginal Health – I’ve heard of using cinnamon tea, tincture, or powder externally on vaginal infections to speed healing, though I haven’t tried this myself. As a Skin Soother – Mix some ground cinnamon with honey and apply to insect bites. In Makeup – Yup … some of my DIY makeup recipes use cinnamon! 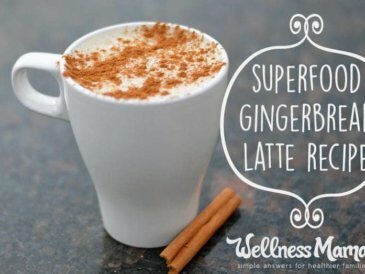 Of course there’s nothing wrong (and everything right) with getting this spice the traditional way in recipes like muffins, cobblers, and pancakes, or in drinks like chai tea, wassail, teas, and this healthier version of eggnog. Pregnant women should not use large amounts (culinary uses or under 1/2 tsp day is fine) or the essential oil as it can cause contractions. As always, check with a doctor or medical professional before using this or any other herb medicinally. There is some evidence that the the coumarin content of this herb can be harmful in large doses. Ceylon cinnamon has a much, much lower amount of coumarin, making it safer to take in large doses or during pregnancy or breastfeeding. It also has a much milder taste, making it suitable for children. I order organic Ceylon in bulk and keep it in a glass jar in my pantry. 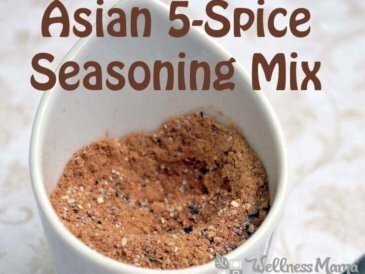 This way, I have it on hand to use in all the ways above or just to sprinkle on foods. Do you use cinnamon? Medicinally? In the kitchen? Both? Share below!